What would you say to a Bluetooth speaker that really delivers in 2019? 40W of music power, USB Type C fast charging, NFC Tap-to-pair, IPX7 water andand sh proofing, microSD and Aux input, all for less than £50? That sounds a lot like the Tronsmart (slightly pretentiously named) 'Element Force'. 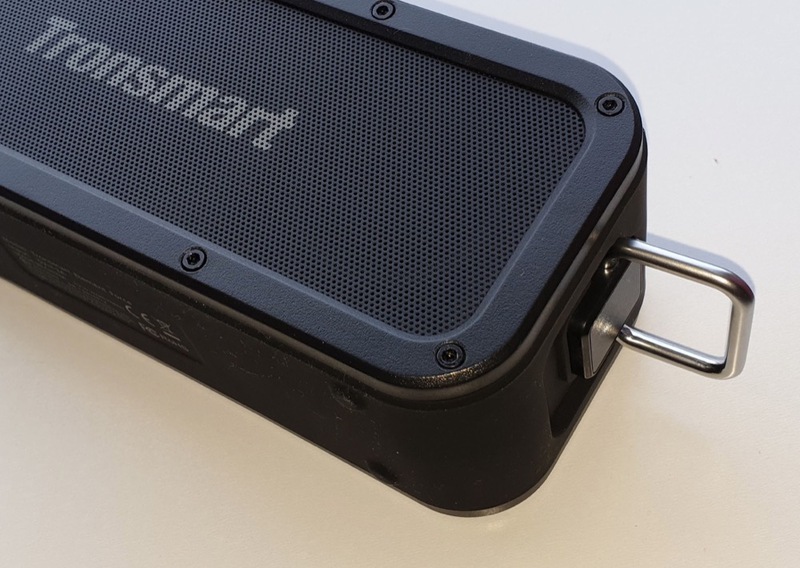 Yes, it's a Bluetooth speaker, but on steroids. As the name might suggest, the Element Force is built like the proverbial brick house, not ashamed of its coated metal frame and screws, this is a black beast that means business. It comes with a Type C charging cable (yay, this is the first Bluetooth speaker I've seen that doesn't use microUSB! ), and a 3.5mm to 3.5mm AUX lead for occasions when Bluetooth isn't suitable. The 'interface' is a set of tiny LEDs hidden underneath the top surface and six embossed rubber control buttons along the top. These are incredibly hard to photograph and impossible to see in real life when the light's not perfect. So the idea is that your finger feels where each is and instantly recognises which ones which - and this does work once you get the hang of it. In fairness, a 'feel'-based approach might even work better in a party environment, where you're unlikely to see standard control labels, so I'll give Tronsmart a pass here. Anyway, the controls, from left to right, are power, playing mode (i.e. 'source'), volume down/skip back, play/pause/answer call, volume up/skip forwards, and 'EQ', which cycles between an as-is sound, 'extra bass' and '3D stereo enhanced'. Most people will settle on the EQ mode they prefer and then just leave this control alone - the 'Extra bass' sounded great to me, more of which below. The small square icon on the right is the NFC target - the Element Force supports tap-to-pair and this worked just fine with both Windows 10 Mobile and Android handsets. One tap and you're prompted to pair, with no need to 'scan' and then wait to find the right accessory, etc. Tap-to-pair isn't common these days (it debuted with Symbian handsets in the 2010 era) and it's good to see it make a come back! 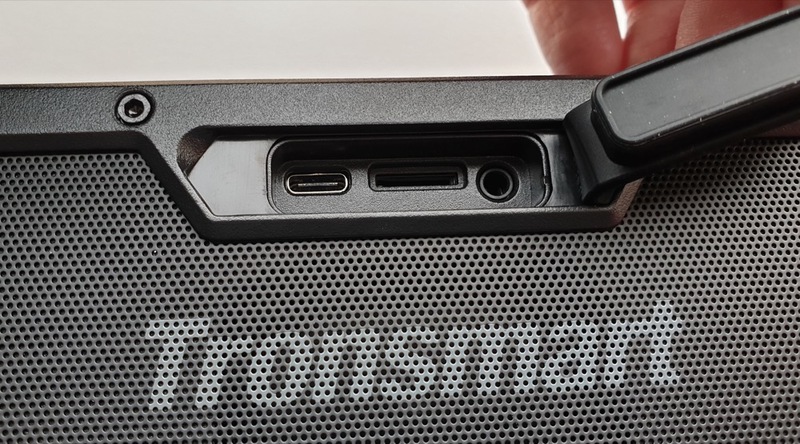 I think the ports are rather obvious once you've peeled the plug back, but there we go... And yes, Type C in a Bluetooth speaker - welcome to 2019. This charges at a full 3A, so the internal 6600mAh battery charges in just over two hours if you plug in a charging source with enough oomph. So it's virtually indestructible and charges in a heartbeat from your Type C chargers, but what about the sound output? It's pretty phenomenal, the high end isn't quite as crisp as on my previous champion speaker, the AUKEY SK-S1, but then that doesn't have anywhere near the same bass volume, doesn't have any rugged attributes, is microUSB and doesn't have tap-to-pair. The Element Force easily wins out overall in terms of feature and functionality - the maximum volume is very impressive. I quickly discounted the '3D' effect mode, since it sounded too obviously 'widened' and processed, but then settled on 'Extra Bass' when using the speaker at up to 80% volume, and 'Standard' mode when going for maximum volume, since otherwise it felt like the bass was overdriving the speaker cones too hard, possibly damagingly so. Playing time is quoted as 'up to 15 hours at medium volume' and this doesn't seem far from reality. Of course, the point of getting something like this is that you use the high volume and massive bass to good effect, at which point the exponential laws of physics leap in - if you're pushing that much air around with twin speakers then the energy has got to come from somewhere. At an event, where you're playing at 90% volume with the Extra Bass turned on then expect closer to five hours playtime. But it's enough, just charge this fully before putting to the ultimate test...! 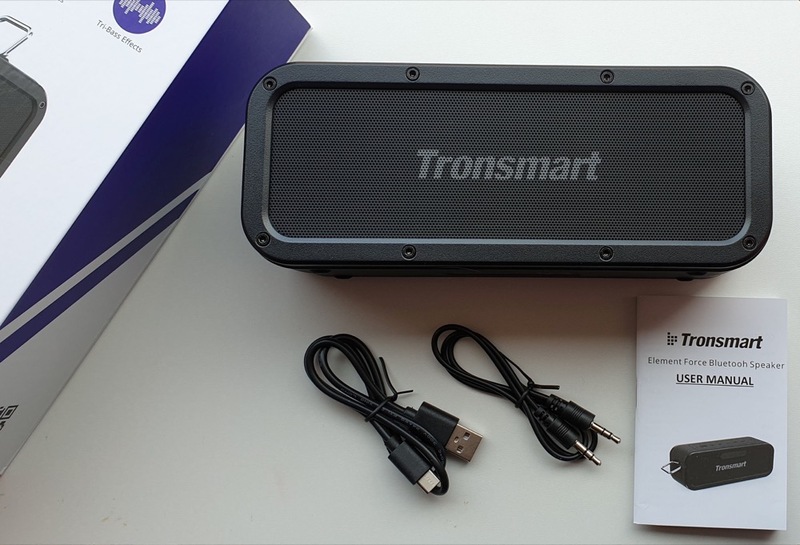 Tronsmart makes a big thing of its 'SoundPulse' technology, but take this with a pinch of salt, it boils down to massaging the audio signals at high volume to avoid distortion - see the SoundPulse tech page for the details. PS. 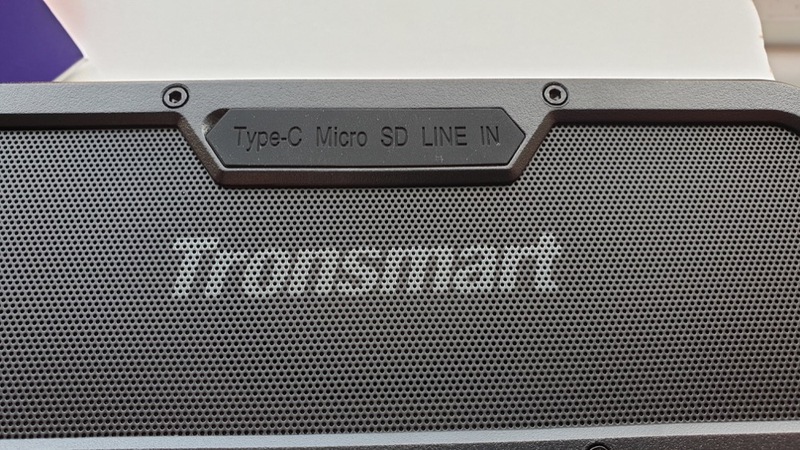 Tronsmart has now sent over some promo codes, valid for a month from now, try code 'Stevefor' in the UK Store for 15% off, and code 'STEVEFOR' in the Amazon US store, also for 15% off. The speaker is also available on Geekbuying.